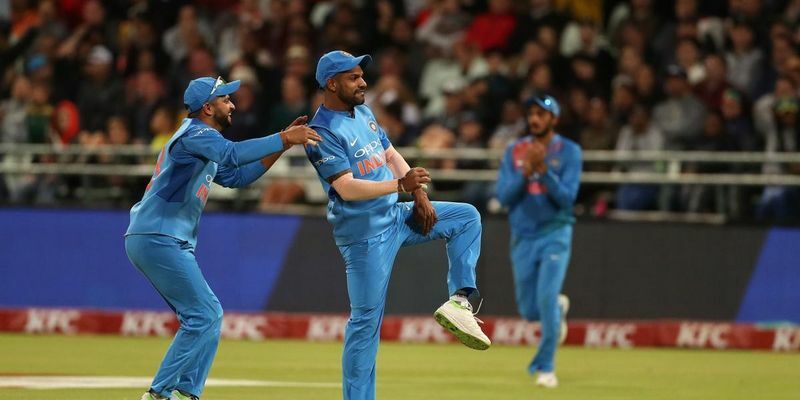 Shikhar Dhawan has admitted that India has developed a bad habit of reading the conditions wrong in the last two games of the ongoing ODI series against Australia. After Australia pulled off a record chase in the fourth ODI, Dhawan stated that they didn’t anticipate the dew to be such a big factor. For the second consecutive night, India had been on the wrong side of dew prediction, which came out to haunt them eventually. In Ranchi, Kohli decided to field first because of the anticipated dew that didn't eventuate and in Mohali, he batted, probably with the confidence that bowlers are good enough if the ball got wet. The two wrong anticipations have brought the idea of how the Indian team are at the receiving end of something undesirable regularly, and Dhawan didn’t hesitate to admit that. “We had expected dew would be a factor in the last game and it didn’t come and here, we didn’t expect dew but it came very heavily,” Dhawan said after the match on Sunday. All said and done, India batted superbly in the first innings to get to a score of 358 runs and with a brittle batting line-up, it was expected that Australia would fail to go past the target. However, Ashton Turner shocked India with what can perhaps be called one of the finest ODI innings under pressure in recent times and his unbeaten 84 off 43 balls didn’t just ensure a win for the visitors, it has also kept the prospect of Australia pulling off a come-from-behind series win alive. Dhawan was all praise for the new Rajasthan Royals recruit. “So of course, when you put such a total on the board, there’s always pressure for the other side and not our bowlers and we were quite in control till the 38th over. But then the ball started coming so nicely and you could play any shot on that surface. “I would give credit to him (Turner) for playing with such composure and taking the game away from us. All his shots were great, he played really well,” Dhawan added. One of the major reasons the game slipped from India’s hands is Rishabh Pant faltering on more occasions than one. On the penultimate delivery of the 39th over, Peter Handscomb had cluelessly stepped out to Kuldeep Yadav, but Pant failed to collect the rolling ball. While that was a difficult chance, the 21-year-old missed another stumping chance down the legs in the 44th over, which prompted the crowd to chant “Dhoni-Dhoni” at the top of their lungs. Dhawan, however, stated that it is unfair to compare Pant to Dhoni, as Pant is still young and has a long way to go. "You can't compare Mahi bhai with Pant. Dhoni has played so much cricket, while Pant is a young bloke. We need to be patient with him. He is a great talent. It is true that those stumpings could have changed the scenario of the match but it was just a game," Dhawan added.